North Korean leader Kim Jong-Un. In the spring of 1953, with the war in Korea bogged down in a stalemate, hundreds of soldiers dying in battles of no conceivable tactical gain, 16 men gathered in a room at the Pentagon to discuss what might next be done. “Future Courses of Action in Connection With the Situation in Korea”, prepared by civilian consultants for the National Security Council, wasn’t — as its bland title might have suggested — a road-map for then-ongoing peace-talks, which would culminate in an armistice that summer. It was a radical proposal to break the military impasse, by using nuclear weapons. General Omar Bradley, chairman of the joint chiefs of staff, made the case for the use of nuclear bombs, as he had often done during the war. “Because of the casualties that will be involved in any stepped-up ground action”, he argued, “we may find that we will be forced to use every type of weapon that we have”. There was just one problem: The Soviet Union’s own nuclear bomb, which it might use if its communist allies were attacked. “The Commies, scattered over one hundred and fifty miles of front, and well dug in, don’t present nearly as attractive a target to us as we do to them”, cautioned James Lawton, the US army chief. For the first time in history, two sides had nuclear weapons — and deterrence had worked. Korea was partitioned, and the war ended. Everything has a context, and the context to the unfolding North Korean nuclear-weapons crisis is this: It isn’t the first one, by some decades. In the summer of 1950, nine MK4 fusion bombs were ready to be delivered had General Douglas MacArthur’s brilliant amphibious assault at Inchon not cut North Korea’s supply lines, recaptured Seoul, and rolled on to Pyongyang and the Yalu river. In April, 1951, the US Joint Chiefs of Staff ordered nuclear retaliation if Chinese troops or Soviet bombers massed in Mongolia began operating in Korea. During 1950-53, North Korea was taught what regime destruction meant: The US’ strategic bombing campaign levelled 75 per cent of Pyongyang, all of Sinanju, 95 per cent of Sariwon, 80-85 per cent of the industrial hubs of Hamhung and Hungnam, and 80 per cent of the port of Chinnampo 80 per cent. North Korea set about trying to acquire nuclear weapons in 1991, as its superpower patron, the Soviet Union, collapsed — depriving the regime of its survival guarantee. The plans for its weapons are now well known to have been supplied by Pakistani nuclear scientist Abdul Qadeer Khan in a cash and missile-designs trade. Efforts to bribe the North Korean regime out of its nuclear pursuit began soon after. In 1998, South Korean president Kim Dae-jung initiated the reconciliation process that became known as the “Sunshine Policy”, injecting billions of dollars into the North’s economy — and, credible accounts have it, into the personal accounts of Kim Jong-il. The effort was doomed. Less than a year after the ink dried on Kim Dae-jung’s Nobel Prize citation, North Korean and South Korean troops clashed. In the wake of 9/11, the US declared North Korea part of the “axis of evil.” North Korea responded by calling off talks — and four years later, tested the first of its nuclear weapons. It is important to understand why North Korea acted as it did. For one, the country’s leadership drew lessons from the fate of one of the Khan network’s other clients, Libyan despot Muammar Qaddafi. In 2003, Qaddafi gave up his nuclear ambitions in return for diplomatic normalisation, only to end up shot by rebels backed by his new Western allies. Saddam Hussein, who gave up his own weapons of mass destruction programme, met a similar fate in 2006. North Korean leaders would also have watched the fate of Ukraine, which gave up its nuclear weapons in 1994, after receiving security guarantees from the US, UK and Russia — all of which proved worthless. From the point of view of North Korea’s ruling élite, thus, getting a bomb isn’t madness, but life insurance. Kim Jong-un fears an East Germany-style regime collapse, with his citizens choosing to merge into the richer South. The dictator also worries that his neighbours might sponsor an internal insurrection, or that the US might attack. The US, we know, has considered that option since at least 2011, when the former US Defence Secretary warned North Korea was just five years away from being able to target his country. But President Barack Obama’s government was deterred by the fact that, while North Korea could be destroyed, its conventional artillery could level Seoul, home to 50 million people. 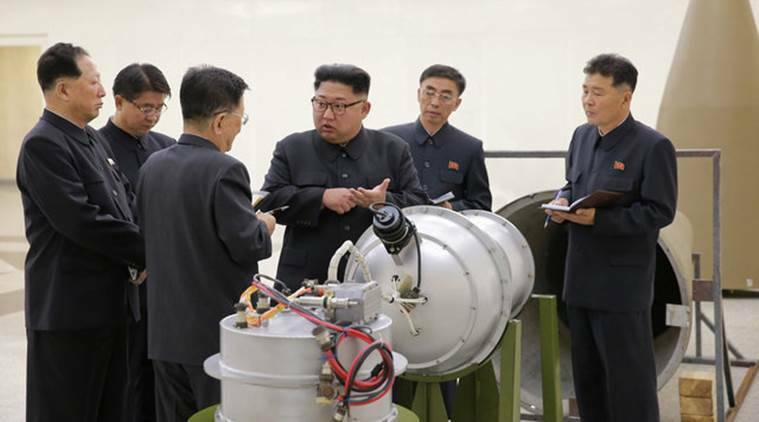 Now, any plan to militarily eliminate North Korea’s nuclear-weapons capabilities has to contend with the fact that it has the demonstrated capability to deliver a fission bomb, with a yield of 50-100 megatons, to the US or Australia. Is there another way? The heretical possibility is simply to learn to live with a nuclear North Korea. The theorist Kenneth Waltz, writing in 1981, postulated that when it came to nuclear weapons, “more may be better”. This, he went on, was because “In a conventional world, one is uncertain about winning or losing. In a nuclear world, one is uncertain [only] about surviving or being annihilated”. North Korea, thus, can use its nuclear weapons only in the complete certainty that it will invite utter annihilation in return — something a regime, no matter how crazed, is unlikely to do. Accepting that North Korea won’t give up its weapons opens the door to pragmatic negotiations that acknowledge the realities. For example, the North Korean government could be offered some economic incentives and diplomatic recognition in return for capping its arsenal. Normalising North Korea will have costs. It might push other states to also seek nuclear weapons. Each new nuclear state raises the odds of nuclear weapons use, either by accident or design. But as nuclear weapons become easier to manufacture — an inexorable consequence of technological progress — these are outcomes the world will have to grapple with. Ever since the US tested the first nuclear bomb in 1945, it was certain that its rivals, and its rivals’ rivals, would do so too. The bomb, the North Korean case has made clear, cannot be kept in the hands of a small club. This is the stuff of nightmares. It is a nightmare we have built for ourselves, though — and we must now learn to inhabit it with eyes open, trying not to sleepwalk towards apocalypse.